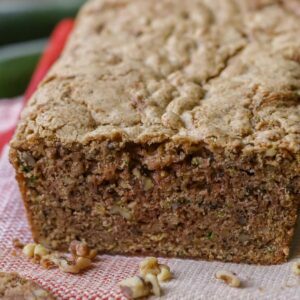 Put your bounty of zucchini to good use with this soft and delicious Zucchini Bread recipe (no yeast involved!). The recipe makes two loaves, one for now, and one for later! It is so flavorful and is filled with shredded zucchini, cinnamon and is a hit with the whole family. Beat eggs, oil, vanilla, and sugars together in a large bowl. Add sifted ingredients to the creamed mixture, and beat well. Stir in zucchini and nuts until well combined. Pour batter into prepared pans. Bake for 55 minutes, or until tester inserted in the center comes out clean. Cool in pan on rack for 20 minutes. Remove bread from pan, and completely cool. NOTE: Bake for 35-40 minutes for mini loaf pans.